CA designed, built and programmed this system to be used to gage major, minor diameters, lengths and other features on a range of specialty bone screws. The system includes data collection for further analysis by customers. 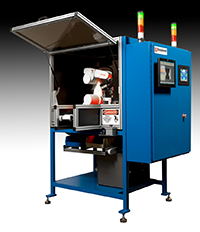 The robot end arm mounted high resolution camera allows for flexible part inspection and gaging programming for a wide variety of lengths and ODs.